As the multiplexes have become more crowded with the latest blockbuster superhero epics at the expense of richly-drawn, adult-oriented character pieces, television has emerged as an unlikely candidate to fill the void. Channels like HBO and AMC have paved the way for premium episodic content that can match cinema from nearly every angle– save for the building-sized screens. HBO in particular has been a trailblazer on this front, regularly producing cinematic, compelling shows like THE SOPRANOS, THE WIRE, and TRUE DETECTIVE. In 2010, HBO added another feather to their cap with creator Terence Winter’s BOARDWALK EMPIRE, a series about crime and corruption in Prohibition-era Atlantic City and inspired by the book of the same name by author Nelson Johnson. Such material demands a strong, visionary director, which Winter found in Martin Scorsese. Scorsese’s successful direction of BOARDWALK EMPIRE’s pilot episode launched the series in high style, setting the stage for a five season-run that would become one of HBO’s most prized properties. The pilot episode begins on the night that the alcohol ban takes effect and Prohibition becomes the law of the land. In Atlantic City, the occasion is marked with a mock New Orleans funeral and a lavish, booze-soaked gala. The smirking revelry, however, belies the fact that alcohol’s illegality is a huge problem for a city whose main source of income stems from sin and vice. Where most see a great loss, others, like city treasurer Enoch “Nucky” Thompson (Steve Buscemi), see an opportunity for immense profit. Over the course of the episode, the story follows the fledgling underground booze trade while setting up its key players. Like any good pilot, the episode establishes the tone and the world quite well, and ends with a dramatic flourish that compels us to keep watching more. BOARDWALK EMPIRE benefits from an immensely talented cast; a development that is no doubt directly attributable to Scorsese’s involvement and inherent attractiveness to serious actors. In a rare starring turn, Steve Buscemi headlines BOARDWALK EMPIRE as Nucky Thompson, a brutish dandy and the corrupted treasurer of Atlantic City. Michael Pitt plays his right hand man, Jimmy Darmody- an ambitious former Princeton student and veteran of the Great War. Kelly MacDonald plays Margaret Schroeder, a demure, pregnant housewife who is active in both the temperance and woman’s suffrage movements. Michael Shannon plays Nelson Van Alden, a newly-minted lawman tasked with cracking down on offenders in the alcohol beat. Shea Whigham plays Eli Thompson, a crooked lawman under Nucky’s employ. Finally, Paz de la Huerta plays Lucy Danziger, a tempestuous nymphet who is currently shacking up with Nucky. Due to the conventions of the pilot episode tradition, no one actor really gets a chance to shine in the spotlight, but each one is set up with a strong set of motivations, ambitions, and flaws that will no doubt be explored to their fullest dramatic potential as the series unfolds. BOARDWALK EMPIRE is similar in spirit to Scorsese’s other period crime epic, 2002’s GANGS OF NEW YORK, in that both projects recreate the rough-and-tumble grit of a bygone era with expansive sets and a generous costume budget. Cinematographer Stuart Dryburgh bathes the image in a wash of earth tones, ambers, and sepias, while Scorsese employs his signature mix of camera techniques— like Steadicam shots, cranes, still frames, whip-pans, push-ins and iris shots—to add immediacy and energy. For reasons most likely owing to the shorter television format, Scorsese eschews some of his regular collaborators in favor of people like editor Sidney Wolinsky and production designer Bob Shaw, who help him in establishing a look, tone, and pacing for others to follow in future episodes. Directing the pilot episode of a given series is often an enticing prospect for established filmmakers because it allows them to imprint their stamp on a project that will continue long after their initial involvement (and the regular Executive Producer payments that go with it aren’t bad either). As such, BOARDWALK EMPIRE fits in quite naturally with Scorsese’s feature filmography—a body of work well known for featuring hoods and gangsters as protagonists (usually of the Italian variety), as well as depictions of chaotic, violent street life and explorations of the American immigrant experience. Nucky sums up Scorsese’s sentiments quite tidily when he casually remarks, “we’re all immigrants, are we not?”. Scorsese’s love of film history is also acknowledged in a scene where Pitt’s character’s family takes in a viewing of a silent Fatty Arbuckle film. Music, a hugely important part of any Scorsese project, likewise plays an integral role in fleshing out BOARDWALK EMPIRE’s bygone era. Scorsese starts on an anachronistic, yet inspired note, with Brian Jonestown Massacre’s modern rock track “Straight Up and Down” accompanying the opening credits. As the story unfolds, he peppers the soundtrack with vintage recordings from the period, with a particular emphasis on the era’s version of popular rock and roll music—ragtime, blues, and opera. Not having been involved in the narrative television medium since his contribution to 1986’s AMAZING STORIES, Scorsese’s first full-on TV pilot was a smash hit, whose big ratings and strong critical praise helped to propel the show onwards for five more seasons. 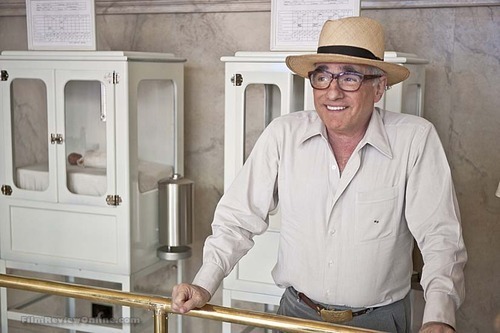 In addition to being a boon for the series’ longevity, Scorsese’s involvement in BOARDWALK EMPIRE had a much bigger effect than he probably could have ever anticipated. An Oscar-winning director of Scorsese’s stature taking on an episode of television was a huge deal—his participation helped to legitimize the current phenomenon of major directors moving into the televised entertainment space. This development created a safe space for an endangered species—directors of intelligent, challenging, and thought-provoking fare—and ensured their survival in a landscape dominated by corporate homogeny, bloated budgets, and disposable blockbusters. BOARDWALK EMPIRE: “PILOT” is currently available on high definition Blu ray via HBO.